Tunicates are found throughout the Indian River Lagoon growing attached to mangrove roots, pilings, oyster reefs, and any hard substance they can find every spring and into the summer. They are also known as “sea squirts” because they squirt water out of their siphons when squeezed gently. Tunicates are invertebrates, meaning that they lack a backbone. The group invertebrates is a very large and diverse group of organisms that includes crabs, sea urchins, clams, jellyfish, sponges, worms, spiders, insects, and many others. Mangrove tunicate. Photo courtesy of Kathy Hill, Smithsonian Marine Station at Fort Pierce. Tunicates come in many shapes, sizes and colors. They can be solitary, colonial (i.e. living in groups) or pelagic (i.e. living in the open ocean, far from land). They are all marine organisms, and though not found in freshwater, some species can be found in fairly low salinity brackish waters. 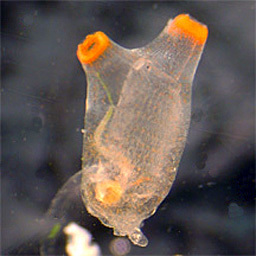 All tunicates are filter feeders and have two siphons. One siphon takes water in, then particles from the water are extracted for food, and the second siphon expels the cleaned water out. Tunicates get their name from their “tunic” or outer covering that protects them from predators. The tunic is made of cellulose, a long chain of linked sugar molecules. Cellulose is more common in plants and is what gives wood its strength. Because tunicates are filter feeders, they help improve water quality by removing particulates and excess nutrients from the water, just like many of our other filter feeders (e.g. oysters and clams). Good water quality is important to all marine animals and plants found in the Indian River Lagoon, and to us humans too. But water quality may not be the only benefit that tunicates give to us. Researchers have been studying various properties of tunicates and have learned that they may possess important anti-cancer properties. A group of chemicals called “Palmerolides” that are found in the body tissues of an Antarctic species of tunicate is extremely active against melanoma, a type of skin cancer. A compound called ecteinascidin-743 (i.e. ET-743 or trabectedin) produced by the mangrove tunicate has also gained attention for its anti-cancer properties and is already used in Europe for treatment against soft tissue sarcoma. Also, scientists believe the cellulose found in tunicates could be used to help repair or even grow human muscle tissue. And just this past year, researchers at the University of Bergen and Uni Research in Norway found that a certain type of tunicate can be used as a renewable source of biofuel and fish food for aquaculture. Black solitary tunicate and colonial royal tunicate. Photo courtesy of L. Holly Sweat, Smithsonian Marine Station at Fort Pierce. Tunicates are in their own Subphylum called Urochordata and are included in the same Phylum Chordata as vertebrates (e.g. mammals, reptiles, birds, amphibians, and fish). Yes, they are in an animal group most closely related to us! Tunicates are cultivated and eaten in many countries including Japan, Korea, Chile and France. Many tropical species of tunicates have a single celled algae living as symbionts (meaning both algae and tunicate benefit from the relationship) inside their tissues (just like algae associated with many corals). 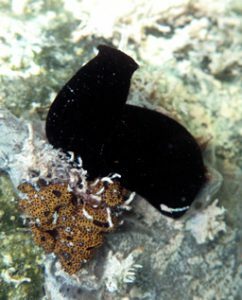 Some tunicates, like the Black Solitary Tunicate (Ascidia nigra) and Mangrove Tunicate (Ecteinascidia turbinata) found in the Indian River Lagoon, have other species of organisms found living on or inside the tunic, including amphipods, copepods, brittlestars, and crabs. Linda Seals helps communities conserve water, live more sustainability, and engage in issues that make a difference.